SAN FRANCISCO, California, May 3, 2012 (ENS) – Four environmental groups have filed a lawsuit challenging the approvals and environmental review for the Willits Bypass, a proposed four-lane freeway around the small town of Willits, in Mendocino County, California. The groups contend that building the road would damage wildlife habitat, oak woodlands and salmon-bearing streams in Little Lake Valley, and would require the largest wetlands fill permit in Northern California in the past 50 years. The lawsuit was filed Tuesday in federal court by the Center for Biological Diversity, the Willits Environmental Center, the Redwood Chapter of the Sierra Club and the Environmental Protection Information Center. “Bulldozing a freeway the size of Interstate 5 through precious wetlands would be wasteful and destructive – a four-lane road is just not needed for the traffic volumes through Willits on Highway 101,” said Jeff Miller with the Center for Biological Diversity. Known as the “Gateway to the Redwoods Heart of Mendocino County,” Willits is a primary stop for visitors who want to explore the towering redwood trees along Highway 101, a major coastal route linking Los Angeles, San Francisco, and the North Coast. For decades, the California Department of Transportation, or Caltrans, and the Federal Highway Administration have pursued a bypass on Highway 101 around the town of Willits to ease traffic congestion. 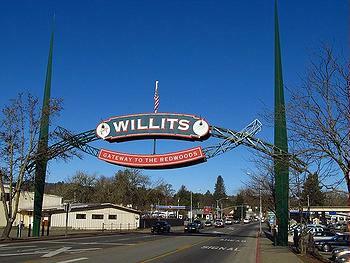 The agencies insist on a six-mile, four-lane freeway bypass freeway and refuse to consider or analyze two-lane alternatives or in-town solutions for Willits, population 5,000. “This is a wake-up call for Caltrans, which should be building efficient public transit and maintaining existing roads, rather than wasting our money and resources clinging to outdated visions of new freeways,” said Ellen Drell, board member of the Willits Environmental Center. The lawsuit is against Caltrans, the Federal Highway Administration and U.S. Army Corps of Engineers for violations of the National Environmental Policy Act and Clean Water Act. For more than 50 years, Caltrans has promoted turning Highway 101 into a four-lane freeway from San Diego to the Oregon border, with a four-lane freeway bypass around Willits. Caltrans first discussed potential bypass designs and routes through Willits in 1988, but by 1995 had discarded all non-freeway or two-lane alternatives. An environmental review for a four-lane freeway was finalized in 2006. The California Transportation Commission, the state funding authority, has repeatedly refused to fund a four-lane freeway, so Caltrans proposes to proceed in “phases,” grading for four lanes and constructing two lanes with available funds, then constructing two more lanes when funding becomes available. Yet Caltrans and the Federal Highway Administration did not draft a supplemental “environmental impact statement” to look at impacts of this changed design or consider two-lane alternatives. The four groups are seeking a court order requiring the agencies to prepare a supplemental environmental impact statement that considers two-lane alternatives, addresses substantial design changes and considers new information about traffic volumes and environmental impacts. To obtain the required wetlands fill permit under the Clean Water Act, the state and federal agencies submitted a what the four groups call a “deficient mitigation and monitoring plan” to the Army Corps to “enhance” wetlands. The plaintiff groups argue that this plan actually alters existing wetlands, causes new impacts to wetlands, endangered species and grazing lands, and makes design changes that were not analyzed or disclosed in the 2006 environmental review. They contend that the Army Corps improperly issued the permit in February 2012.